For some reason, I haven't really mentioned anything about my knitting obsession on this blog before, but it went into high gear last fall, when I helped host a knitting workshop for beginners and intermediates. I've been knitting since I was about 9 or 10 years old, but I've only begun attempting actual projects in the last 6 years or so. 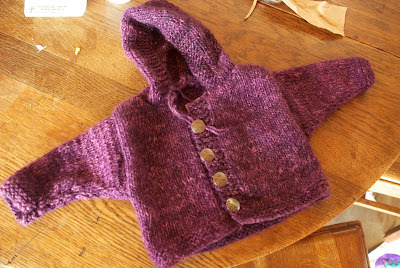 These last two years or so, I've started knitting baby sweaters for all the cuties being born around these parts. This one above I love, it's so warm AND has a hood. Essential for Mattole babies. I've also been knitting socks, hats, scarves, fingerless gloves, and I even tried a pair of mittens. I don't know why, but following instructions to create something just lights me up. Weird. I know. But fun. I'm so excited about it that I've started contemplating raising my own fiber animals so I can raise some of my own yarn. We have a great local fiber artist who knows a lot about it. We've discussed what it might look like to get a local fiber cooperative going, and to create a micro brand of yarn. A fun pastime, contemplating what's possible, and how delightful it would be to knit with locally-raised Mattole yarn.